As the nation of France mourns the deadly Charlie Hebdo shooting, a new police shooting in Paris has further put the city on edge. On Thursday, a police officer was killed in a shootout in Paris, while another city employee, a street cleaner, was seriously wounded. According to France24, the suspect in this latest shooting is still at large, though authorities say it's unclear whether the attack is related to the Charlie Hebdo assault. French Interior Minister Bernard Cazeneuve told reporters on Thursday that the shooting, which took place in the southern section of Paris, began while the police officer was investigating a traffic accident. The alleged shooter was not involved with the accident. Cazeneuve said a search is now underway for the alleged shooter, and authorities are currently trying to identify the suspect. The interior minister warned that it's too early to draw any conclusions. 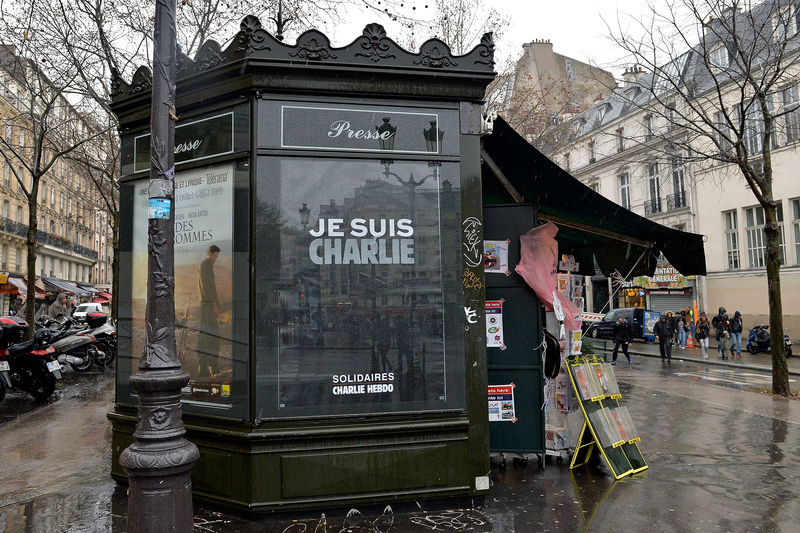 However, French police are taking more precaution following the tragic Charlie Hebdo attack. A Paris police official told Le Monde that "a heavily armed individual in his vehicle at 8 a.m. is far from trivial." A nationwide manhunt is also ongoing for the two remaining suspects in the Charlie Hebdo shooting, which killed 12 people and left almost a dozen wounded. Brothers Said and Chérif Kouachi, both French nationals in their 30s, were identified by French authorities on Wednesday night. A third suspect, identified as 18-year-old Hamyd Mourad, surrendered to police early Thursday morning. According to The New York Times, French authorities detained and questioned seven people overnight in connection to the Charlie Hebdo attack. Cazeneuve confirmed to the media that seven people were questioned, but did not specify on their connection to the Kouachi brothers. French Prime Minister Manuel Valls added in an interview with RTL radio on Thursday morning that the government's main concern was preventing future attacks. Early on Thursday, authorities issued a statement requesting information on the two suspects, who police say are "armed and dangerous." According to officials, one brother is believed to have connections to al-Qaeda. Meanwhile, 18-year-old Mourad walked into a police station in Charleville-Mézières, nearly 150 miles northeast of Paris, and turned himself in. French media has reported that Mourad's classmates claimed he was in school during the attack, defending his innocence.